Welcome to my freshened up foyer! Diva Dog says “Hi!” too. I’ve really been enjoying my dining room that I updated back in January just by changing out accessories (some new, some vintage) and by painting my brown chandelier. I decided to use the same method to update my foyer and I love it! The starburst mirror was a very affordable find at Home Depot. They are available on their website for only $35. 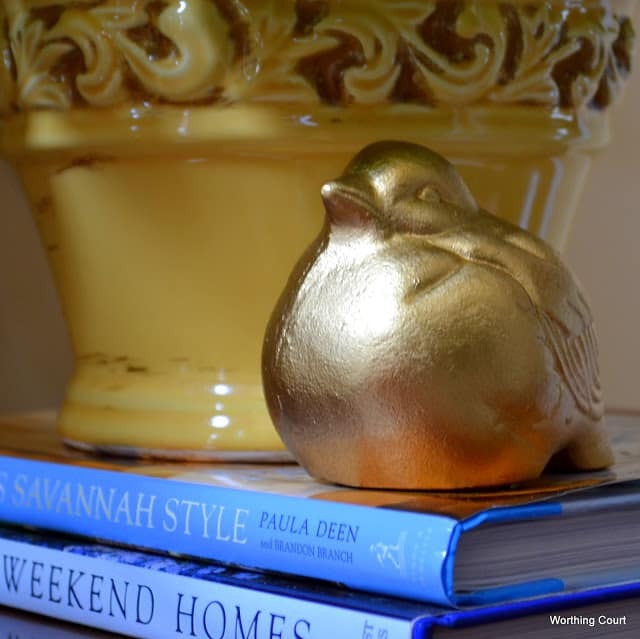 I added a cyclamen to a pot that I had in my stash and painted a little brown metal bird with gold paint. Added my Baldwin brass lamp that I’ve had for years, and called the chest done! The garden stool is a new addition from an awesome place in High Point purchased at below wholesale. I’ll get around to telling you about that place one of these days. The biggest change is probably the addition of this bench that my daughter, Ms. JB, gifted to me. She doesn’t have room for it in her new house so I was the lucky recipient. Thank you Sweet Pea! 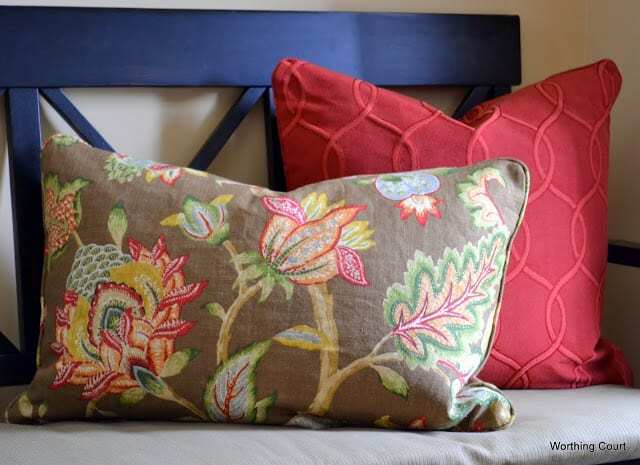 I love the colors in the fabric that I used to make the pillows. I thought this rug that I ordered from Overstock.com would make a nice modern addition to the space. I cannot tell you though, how much I agonized before I ordered it – I was so afraid! What will it look like??? What if people don’t like it??? Will they think I’m weird??? Sheesh! Tip – order what you like, not what you think everyone else will like and you will love it! I can’t get a shot of the entire space from floor level, so here’s a bird’s eye view. And a view looking toward the front door from the family room. You have a very pretty foyer. Love the rug! It shows your sweet personality. Your chest is dressed so beautiful. The flowers really pop. The mirror was a great choice. I Love the bench and the pretty pillows. What is the difference in the size of the chest to the bench? Hi Dee. The chest is 37″ wide and the bench is 48″ wide. No – it isn’t FLS. I plan to do a post about it in the next week or so and then see if we can get a group together to go shop! Suzy, I love everything you have done in your foyer. I am such a fan of benches. They are like table tops plus to me. I’m sure you gave your daughter a great big hug for your pretty new bench! It was made for the wall in your foyer… and your pillows make is so warm and inviting! 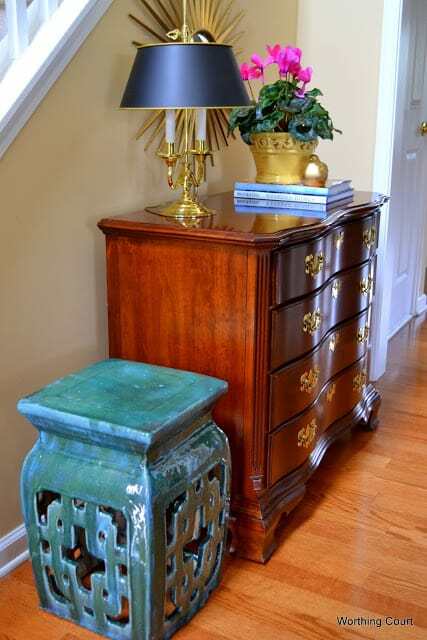 I LOVE the chest in your foyer… so classic and inviting. I have a small chest almost like that but never thought to try it in the foyer! You have inspired me! Garden stools are a real favorite of mine! Yours is gorgeous and adds such a lovely element and a big pop of color! Beautiful foyer! Now all I need to do is drop by with a plate of cookies! It looks beautiful! I love the bench!!! fVery nicely done the plant adds a nice splash of color. Love the pillows. Great job. Hi Suzy! 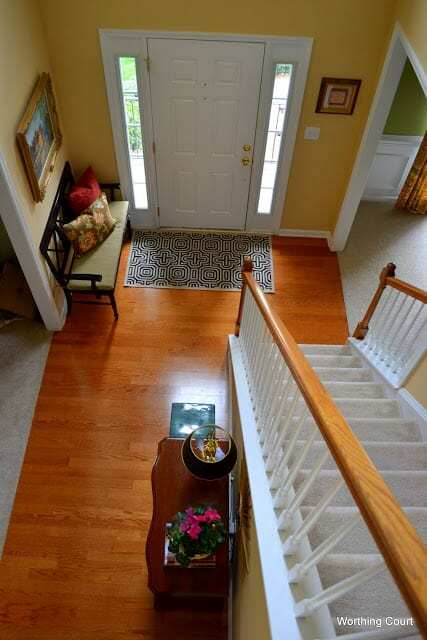 Oh, your foyer is gorgeous! Love your mirror and everything else. 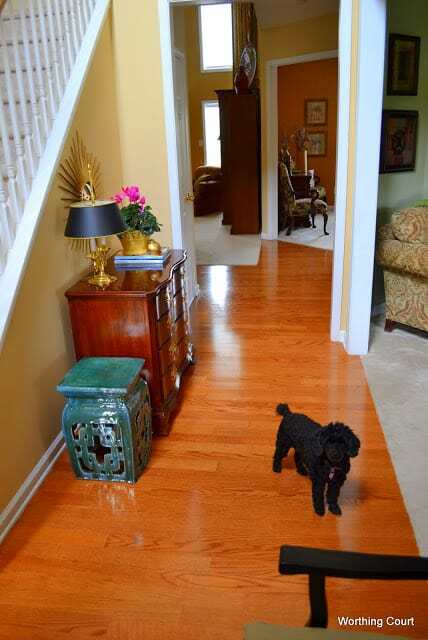 That is one beautiful hardwood floor too. Absolutely beautiful Suzy! 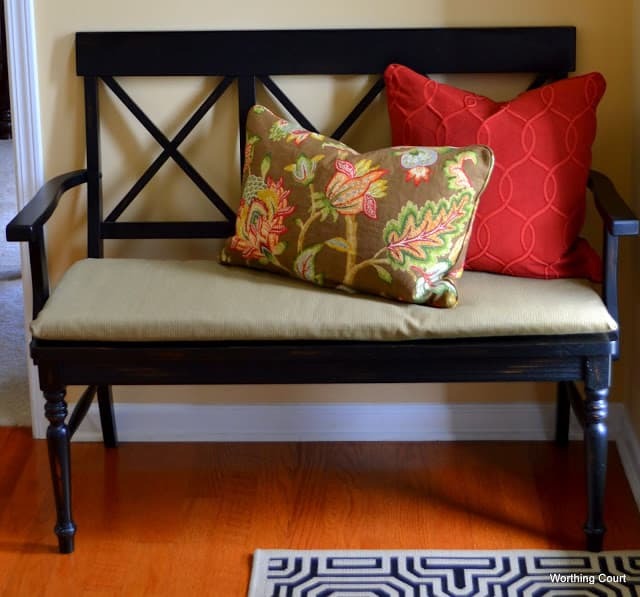 I love the bench, the pillows, the mirror and the hardwoods! So pretty! You did a great job pulling it altogether! It all looks amazing! Love the bench and the fabric you used for the pillows is perfect! The rug, no need to agonize, it looks great and you loving it is all that matters! Your entry is lovely, Suzy. I love the rug. I’m so into adding touches of black & white (or cream). I just love how it makes anything around it pop. I also really like your bench. Looks beautiful, and very springlike. Wonderful bench and I agree,buy what you like. 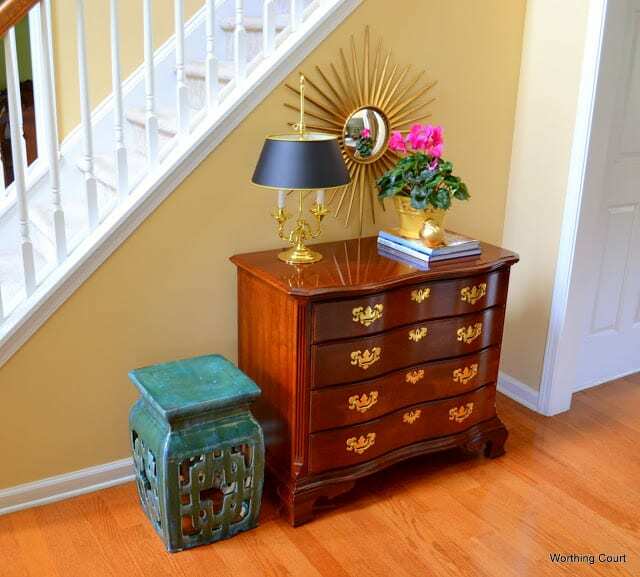 Beautiful changes in your foyer! 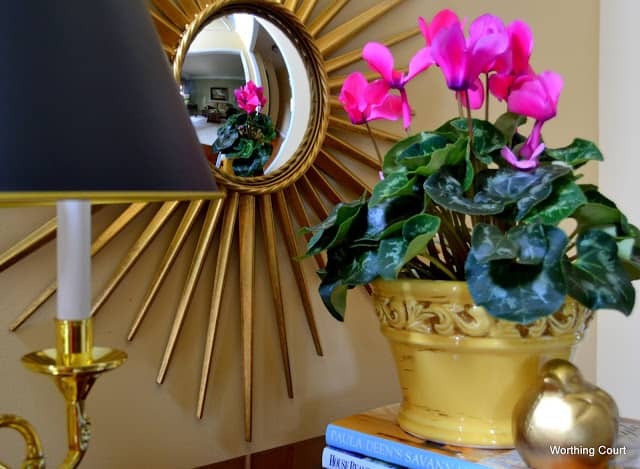 I love the starburst mirror and other elements of your vignette! Suzy, I love the foyer! The starburst adds such pizazz and the fabrics on the pillow add the right punch of color. It all looks great with your rug. Great job!! p.s. love the bench, too!! Suzy, your foyer is lovely. The first thing that caught my eye was the pretty wall color. It is a sunny, happy color that is a wonderful background for the chest and mirror. How lucky for you to be the recipient of that bench. I don’t mean to go on and on so I will just say that your floor is beautiful and I love the rug — and everything! Thanks for coming to Your Cozy Home Party. 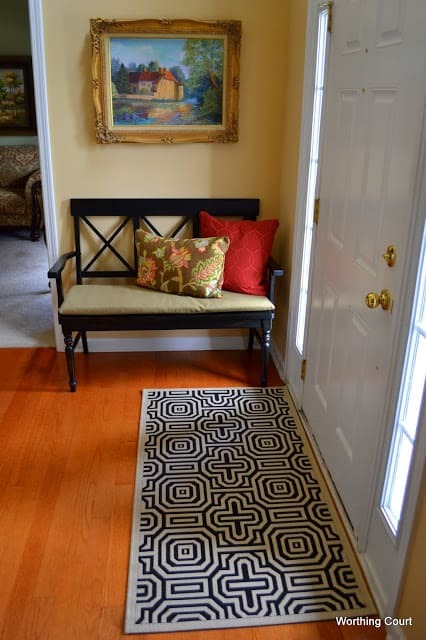 The foyer looks beautiful, and the rug is just perfect there! Love it. I love your new rug! I am with you on ordering something online. I ordered my light fixtures from Overstock and I was so questioning myself, but I love them! Great job and look in your foyer. I always like a foyer and yours is decorated very nice. Thanks for sharing. What a fresh space. I have the same sunburst mirror in my guest room and I love it! OH, this is so pretty and glamorous. And I so love the color. You have such a vibrant, welcoming home. Ooh how pretty! I’m so glad you linked up! I just checked stock on that mirror and there are 3 at the store close to me. I’m going to get one tomorrow. Don’t know where I’ll put it, but I’ve been wanting one. Thanks for giving the link! 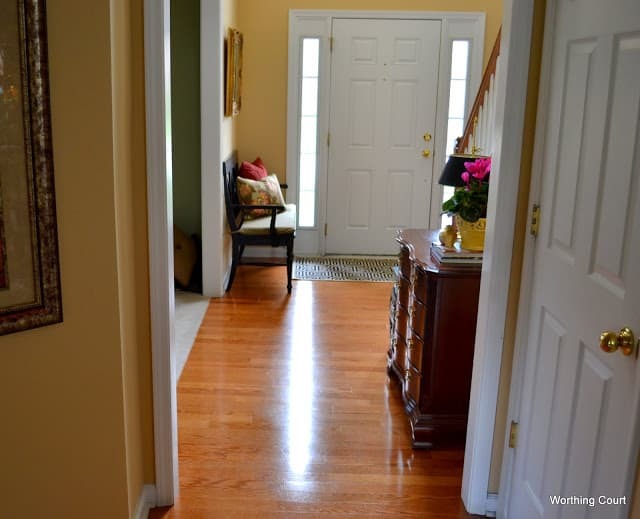 Your foyer looks great! Love your rug–aren’t you glad you got the one you like? Everything works together very nicely. Funny about your lamp. Brass seems to be making a bit of a comeback these days! In my book, Baldwin always made the best brass products. I really like your lamp, and it’s perfect for that spot. I love the yellow! I have something similar in my house. It makes such a warm place to live. Very pretty. THis is such a pretty foyer! I love the new bench and the gorgeous pillows! Thanks for sharing! I always enjoy seeing what you have been up to! So pretty! Love the mirror and the pillows. Fabulous!! Oooh it looks so pretty! I’m crazy for gold these days so I love all the details 🙂 And the pillow colours are beautiful! Not to mention that rug, great pick! The bench looks so warm and welcoming :-). I linked up with Kelly too. So many great ideas!